Argos have discounted all of their home cubes range, all stock in different colours and sizes all discounted, not a bad price considering. Items start from £9.99 for the 2 cube storage, discounts across all of their range. Delivery from £6.95 still works out cheaper than they were. Aldi have nice sets of 3 (floating shelves or stacking) for £8. They are pretty sturdy. 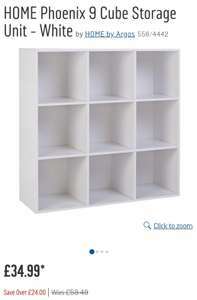 I have one of these and a couple of Kallax. This looks like a 5 year olds woodwork project that the parents have to say they done a good job crossed with homer simpsons DIY compared to a very solid and presentable Kallax. Unless you are very poor and have been living out of cardboard boxes until now either stick with what you have or get a Kallax. The kallax ones from ikea do not have a back panel. Is there anyway to make the Argos website show you more than one store, their site is terrible. Is there anyway to make the Argos website show you more than one store, …Is there anyway to make the Argos website show you more than one store, their site is terrible. Wow it really is that bad, you'd think it'd be bright enough to show you the nearest store with stock or the closest 5 or something. The back plate s the only thing that holds this house of cards together. why not buy a sheet like this: diy.com/dep…rue and cover the back? why not buy a sheet like this: …why not buy a sheet like this: https://www.diy.com/departments/hardboard-sheet-th-3mm-w-405mm-l-810mm/1696236_BQ.prd?rrec=true#icamp=recs and cover the back? I prefer it without, the air can circulate more. Go for kallax from Ikea. Might be more expensive but at least it's a lot better quality than argos. Deal posting newbie! This is kraigisonfire first deal post. Help out by leaving a posting tip or just to show your appreciation for their contribution.